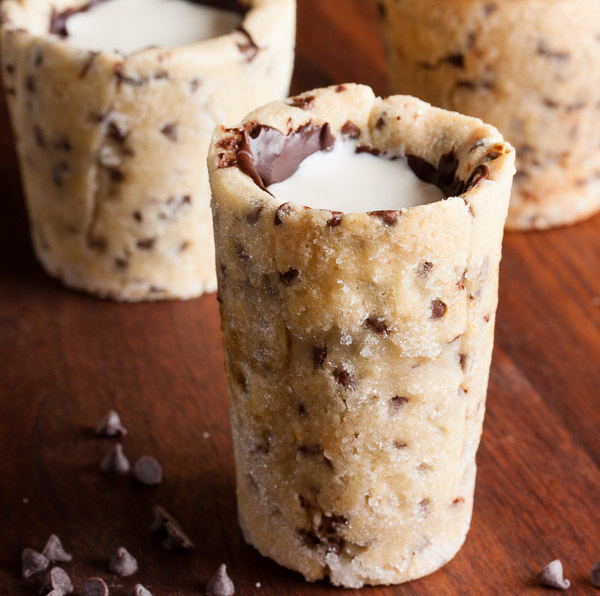 The thing is, I’ve seen cookie shot glasses before. For example, Shari at Whisk made some gingerbread ones back in 2008, and there’s a tumblr called Shotibles that features several of them (although it hasn’t been updated in about a year and the associated blog has shut down, so there are no instructions or recipes). I have no doubt there are more – that’s just what I found with a quick search. I’m not sure what’s so revolutionary about these, except maybe the fact that they’re chocolate chip cookies. I mean don’t get me wrong, I’m sure Ansel’s version is amazing and I would love the chance to try one (I read something about gooey Valrhona chocolate chunks and vanilla-infused whole milk), but the shot glass concept itself isn’t new. The best dough for something like this is obviously one that doesn’t spread or distort as it bakes, right? Have we all seen that cookie bowl fail? That’s what happens when you use the wrong dough. A cookie cutter dough should be ideal, but I’ve never seen roll-out chocolate chip cookies before. Google? Oh look, SweetSugarBelle posted a recipe in 2011. Sounds like a great starting point! Next, some sort of mould to bake them in. Shari recommended using an oven-safe shot glass. 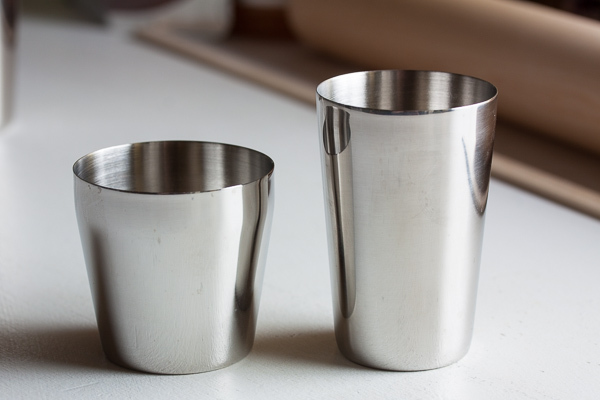 I know I’ve seen stainless steel shot glasses before, but could I find any? No, of course not. I did, however, find some rum baba moulds (both tall & thin and short & wider) that looked like they’d do the trick. I bought one of each just to do some testing. A popover pan looks like it should also probably work – the cups would be slightly larger than a shot glass, but that could be a good thing. Shari formed the cookie inside the mould, and based on the photos I’ve seen, so did Dominique Ansel. I actually tried to do one formed on the outside just to see how it would look, but it just fell apart and it’s best to forget about that attempt altogether. Plus by forming the cup on the inside of the mould, the outside of the cookie has a clearly defined shape and a smooth flat bottom. If the inside is a bit misshapen? No one will know. I brushed the insides of the moulds with shortening and then sugared them as well. Next time I’ll skip the sugar, or maybe just use it on the bottom, because the finished cookie came out with a bit of a sugar crust. Not quite the look I was going for. I used a small circle cookie cutter to create a shape for the bottom of the cookie and dropped that into the mould. For the sides, my first thought was to cut a rectangle of dough and form it into a cylinder to put into the mould. But the dough cracked and broke when I tried to curl it. So what I ended up doing was cutting that rectangle into strips and then pressing them into the mould one-at-a-time, ensuring there was some overlap with each other and the bottom circle to create a good seal. 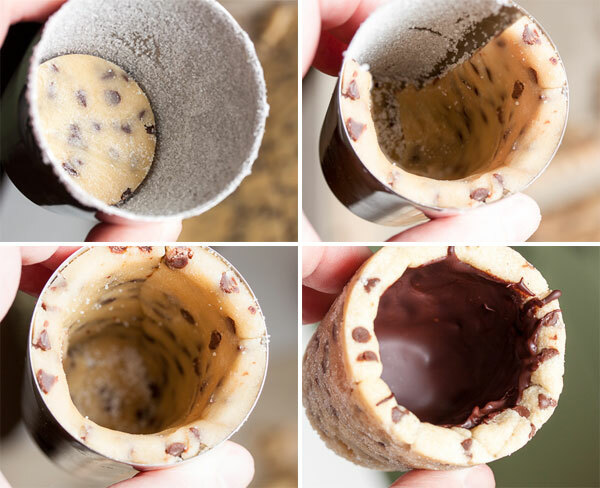 I made one cup using each of the two moulds, and then I got fancy and used them together as a 2-piece mould to give it a more finished appearance both inside and out – with the cookie inside the shorter mould and the taller mould inside the cookie. In the end, it didn’t make much difference other than needing more baking time. So don’t worry about trying anything like that. Just forming the cookie inside a mould is sufficient. The cup shapes needed a longer baking time than a regular cookie. Since I only made a few sample cups this time around, I cut the rest of the dough with a cookie cutter and baked them up as regular cookies. Those took about 12 minutes, but I didn’t feel like the cups were done until almost 17 minutes. The bottom of the cup puffed up a bit in the oven, so I flattened it back out before it cooled completely. The mould retained a lot of heat, and it was about 15 minutes before they were cool enough to get the cookie out. And then they came out fairly easily – I just had to pat the bottom a few times and the cookie popped right out. Other than the aforementioned sugar crust, I think they turned out great! The real test, however, was would they hold milk? Sadly, no. They leaked. Shari suggested putting them in the freezer to help prevent leakage, but I didn’t want to eat a frozen cookie. So instead I melted some chocolate and applied it to the inside to create an inner chocolate lining. I’ve seen that trick used before with cookie bowls. More chocolate? Bring it on! And it did the trick. Success! I now have (semi) perfect little shot glasses that will hold milk. Yay! So, verdict? These aren’t that difficult to make at all. You just need a good non-spreading cookie dough and some chocolate to coat the insides. And because of the longer baking and cooling times, you’ll definitely want more than just a couple moulds to work with. Yes, mine are a bit wonky looking. But you can learn from my mistakes and yours will be so much prettier. So get out there and bake some cookies! In the bowl of a stand mixer fitted with the paddle attachment, beat the butter and sugars together on medium speed until light and fluffy, about 3 or 4 minutes. Scrape down the sides of the bowl and add the egg yolk and vanilla and beat to incorporate. Turn the mixer down to low and add the dry ingredients, mixing until just barely combined. Remove from the mixer and knead in the mini chocolate chips by hand to ensure they're distributed evenly. Divide the dough into 2 portions. Roll each portion out onto a piece of parchment or wax paper to just shy of 1/4" thickness (I used a 3/16" guide). Stack the 2 pieces (paper included) onto a baking sheet and refrigerate for at least 30 minutes (I let them chill overnight). Prepare your moulds by brushing the insides with shortening. Remove one of the dough pieces from the fridge at a time (keeping the dough chilled will help prevent spreading in the oven). Use a small circle cookie cutter to create a shape for the bottom of the cup. Then cut out multiple strips slightly more than the height of your mould to create the sides. Drop the cut-out circle into the bottom of your mould, and then press the strips into the mould, along the sides, slightly overlapping the bottom to create a seal. Continue adding strips and pressing them together, working your way around the mould until you've created a complete cup shape. Place your moulds on a baking sheet and bake for a few minutes longer than whatever your original recipe calls for – in this case, about 13-17 minutes. Keep an eye on them – they will begin to brown around the top edge when they're done. Be sure not to underbake these – you want a sturdy cookie to hold your milk. Remove from the oven and place the moulds on a cooling rack. When they're cool enough to handle, turn the moulds upside down and pat the bottom a few times to get the cookie to drop out. You may need to squeeze the sides a bit to get the cookie to loosen. Gently melt the chocolate in a small microwave safe bowl or on top of a double boiler, stirring often so it doesn't scorch. 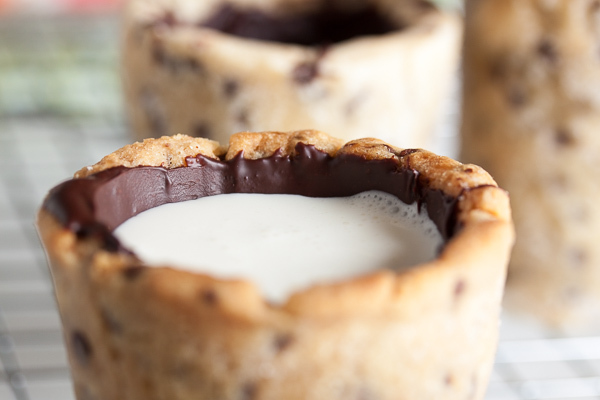 Working with one cookie cup at a time, pour in a small amount of the melted chocolate. Immediately, swirl the chocolate around a bit and pour out the excess – you don't need a thick layer of chocolate, and a thinner coat will dry quicker. It doesn't matter at this point if the sides are completely coated – this is mostly to ensure the bottom has a good seal. If the sides are coated? Great, you're done! If not, use a butter knife to apply a small amount of chocolate at a time to completely coat the sides. Again, you don't need a thick coat, but you do want to make sure there isn't any cookie exposed. Allow the chocolate to dry completely before filling the cups with liquid. What an interesting read. I love that you took the time to make these cookie shots. The concept is so simple but I don’t know if I want to go through all that work, so extra kudos to you! Thanks Christine! I have to admit, if not for my friend asking for them, I probably would have never tried this. And in the end they’re really not much more complicated than making cookie cutter cookies. The biggest hassle was finding an appropriate mould. Great job!!!! I’m not sure I have the patience to make these, but they look awesome! I am very tempted to give them a try. These are looking absolutely great! For what it’s worth, I think yours are more attractive than Ansel’s – straighter, a more appealing color, and the sugar crust is a positive addition! I usually skip by fiddly-seeming recipes, but this one…might be the exception! Thanks for posting your efforts! 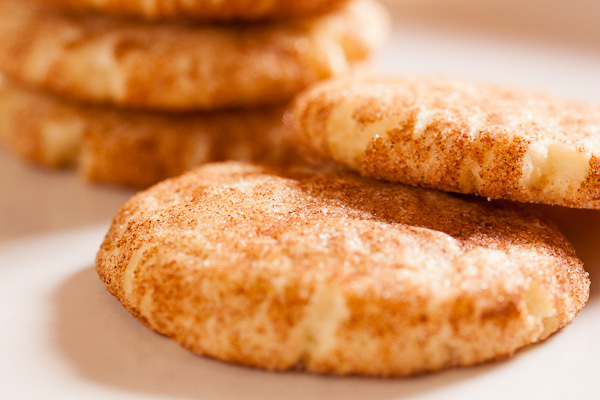 I’m a big fan of simpler recipes too (as you can tell by all the drop cookies on this blog). I was honestly expecting to have several failed attempts at these cups, but these were surprisingly not that complicated to make at all. I really lucked out in my choice of cookie dough. Do you have a cookie recipe that you can recommend for this? This is great. I’ve been trying to find a recipe for these that doesn’t include store bought cookie dough (blech) . I appreciate the detailed description of what you went through to get to the final product! I’m definitely making these. HOLY COW – I just shared these with my facebook followers, tried to tag you – but don’t see you out there. These are AMAZING, I think my husband would marry me all over if I could perfect these, I would be too intimidated to make these, they are out of this world!! Do NOT be intimidated by this recipe. It’s seriously not that difficult if you have the moulds to work with! Would popover pans work instead of shot glasses? I’m sure they’d work fine, you’d just end up with a slightly larger cup. Are you going to give them a try? These would be great filled with ice cream, chocolate mousse, or cheesecake! WOW, this sounds good, but also sounds like a ton of work, and takes forever to make. I think I will just stick with my adult jello pudding shots. They are awesome and east to make. Whatever you use, it needs to be oven-safe. So stainless steel shot glasses would work fine, but not glass. You might want to just go to a local kitchen store and see what they have – you might have options in your country that we don’t have here! I’d like to try it, so is it possible to have the ingredients in gramme? I want to make these for my son’s birthday party as get are great for both adult and kids. Since I don’t have a popover pan can I use the cupcake pan? How long do they stay fresh? I want to make them ahead of time. You can definitely use a cupcake pan, but they’ll be more like small bowls than cups. If you’re okay with that, go for it! Like most cookies, they should be good for at least a week, maybe two. Keep them stored at room temperature in an airtight container. Good luck! Wow. That has to be the best comment I’ve ever gotten. Thank you so much! Hopefully they turn out with the silicone mould. I remember reading somewhere that someone was going to try making them with a mould like that, but I never heard how it turned out. Are you going to try them? Please post back if you do! So I gave them a try last night with the silicone mould. Being able to just sort of shove the dough in and squish it around and pinch on either side of the mould was helpful in that you didn’t have to do much shaping yourself. My one real complaint was how much longer they took to be done. After about 20 minutes the tops were done, but the insides were still pretty doughy. It took close to another 10 minutes for the sides of the cups to be cooked properly. I may try this again with a thinner cookie dough since you don’t have to worry so much about the actual moulding. Wow, that is a long baking time. I’m guessing the tops were a bit overdone by then too. Even just in the metal moulds that I used, they took a really long time to bake. Not that long though. Thank you so much for letting us know how it worked out! What a brilliant idea! Can’t wait to give it a try. how many shot glass size cookies did it make approximatley? 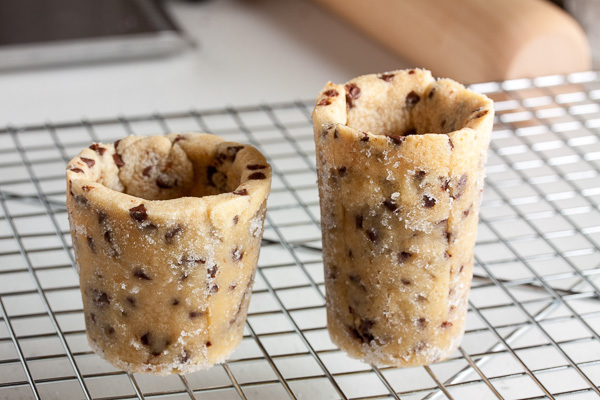 Sorry, I only made a few shot glasses out of this recipe, and made regular cookies out of the rest of the dough. Hi Sean – I’m sorry to hear you had a problem with this. Mine puffed up a tiny bit on the bottom, but I could just flatten them back out with my finger. I did try one cup with something inside, but it took a really long time to bake and I didn’t actually notice any difference in the way it held its shape. Did you use the recipe I have posted? Or a different recipe? I did follow yours and another one . 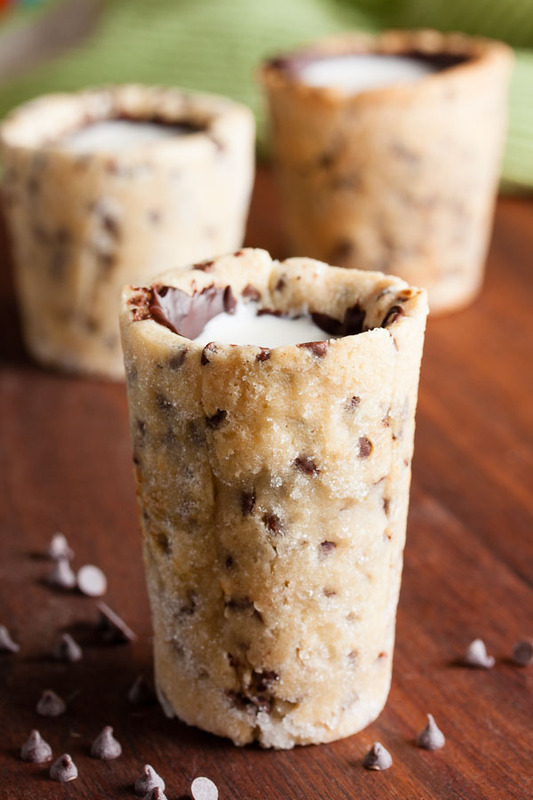 They just puffed up like a cupcake instead . .
To make these cookie cups work, it’s really important to use a cookie dough that’s meant to be used with cookie cutters, as they’re designed to hold their shape while baking. Do you have an email where I could pm you instead ? Can I use ceramic cups instead ofshot glasses as we don’t have these here? If the ceramic is oven-safe, you should be able to use them. But only if they’re marked oven-safe. Otherwise they’ll crack and you’ll end up with a big mess. I wouldn’t try it unless you’re sure about this. You’ll probably need to adjust your baking time as well as ceramic bakeware holds heat differently than metal. Could you maybe find some other type of mould, like a popover pan? BUMMER–I tried to make these tonight and did not have success. 🙁 I followed your recipe exactly and used the metal molds. I got 11 from the recipe. They totally puffed up, though, and after 17 minutes I took them out and used the handle of a spatula to push the sides back in place as the entire mold was filled with dough and the sides were slipping down from the top. I did this again at 24 minutes because they were still puffy and definitely doughy. Maybe I put too much dough in each one, but the thickness looked just like the ones in your photo, so I was excited that everything seemed right. I appreciate any advice you have as I sure would like to share these with friends. I’m sorry to hear you had problems with this one! One other person had a problem with them puffing up as well, but I haven’t heard back from him and am not sure what went wrong there. It’s possible the butter was too soft, or the dough too warm – that could cause the problem with the dough slipping down. You could try refrigerating the dough before baking – you could even put it in the moulds first and then refrigerate it for awhile to help it hold its shape. But there really isn’t anything in this recipe to cause them to puff up – there’s no baking soda or baking powder, and not even a whole egg, just a yolk (you just used the yolk, right? using the whole egg could have caused the puffing). Please let me know if you try this again – I’d love to help you figure out what went wrong and be able to help anyone else who might have a similar problem! 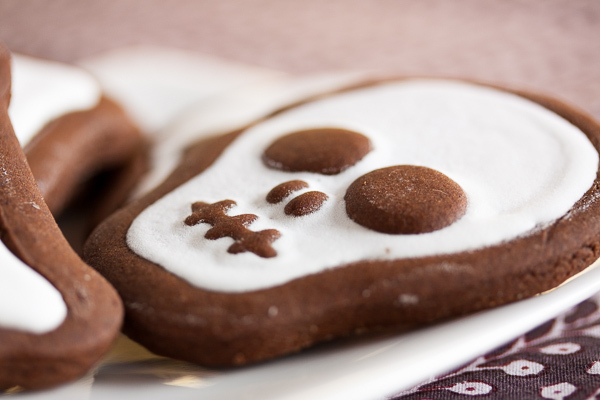 RIGHT–I read a few different recipes for this treat and combined the techniques, so I did refrigerate the filled molds before I baked them. Perhaps that is also why they took so long? The engineer in me thought that your approach of rolling out the dough and cutting a circle for the bottom and rectangle for the tube was brilliant, so I adopted that from you. Per your recipe, I did use just the egg yolk. I did try a second batch, again using your recipe and technique and did not chill them before baking. I rolled the dough out a little thinner, and got 14 shots this time. The dough did not puff up as much, maybe because I used less, though they did slip down from the top of the mold and so at the half way point of baking, I took them out and used the flat handle of a fork to press everything back in place. UGH. Too much fussing for me. I also wanted to let you know that removing the cookies from the molds was not easy for me the first time. Although I sprayed them thoroughly, they sure did not just slip out for me with a little pat as you and some others indicated. I had to put my fingers inside the baked cookie and twist and pull to release it from the mold. Not easy and I broke two of them. So, the second time, my husband wisely suggested using a narrow sling of parchment to help. HOORAY! That totally worked! 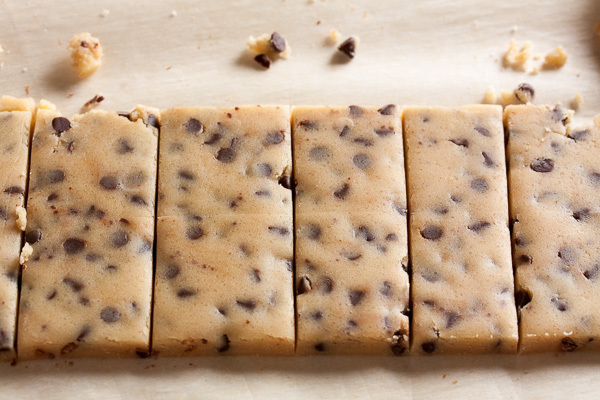 I just used a 1/2″ by 6″ or so length of parchment as a sling inside the mold and pressed the cookie dough on top of it. Once they were baked and cooled, it was easy to use the overhanging parchment to extract the cookie from the mold. I must say that everyone at the party LOVED these cookie shots, both the thicker first batch and thinner second batch, so that is good. I think that the sturdy and less sweet dough definitely needs the extra chocolate slathered on it, so extra bonus because it is necessary to seal the shot for the liquid, anyway. I am not sure that I will go through the process again, though, because it was pretty labor intensive. Appreciate your willingness to help and perhaps the parchment idea will benefit someone else. That parchment idea is BRILLIANT. I always use parchment in loaf and cake pans, but it didn’t even occur to me to adapt it to these moulds. I’m sorry to hear you still had so much trouble with them though. I didn’t have any issues with mine slipping at all – I wonder if using more flour would help the dough hold its shape better? It’s really interesting that the thinner ones puffed less. Next time I make some roll-out cookies I’ll test a few at different thicknesses and see if that holds true… That’s really good to know about. I think that we used the same mold, from Ateco, for these, so it is interesting that we had such different experiences with the same dough. I guess that leaves the oven as a potential culprit. Mine is brand new and calibrated, so that is probably not the cause, either. A mystery, for sure! Ateco also makes a shorter and wider shot glass, so perhaps I will try that should the occasion arise again. I saw both of them at Sur La Table, and bought the taller one because I was thinking about the photos on your blog. Maybe the squatter version would work better for me. I will keep you posted. . .
You’re right, it is weird. And not knowing bugs me! Just fyi, my oven is old and totally out of whack, but I use an oven thermometer rather than trusting the dial, so my temperature was pretty accurate. Yes, my moulds were the Ateco ones too – I used both the tall and short ones and didn’t notice any difference between them in how the cookies turned out. Will do! Now, I am planning to make your Chewy Chocolate Gingerbread cookies for my first-ever book club meeting on Wednesday. . .
Ooooh, warning – you might want to make a double batch. Those cookies are the BEST. EXCELLENT–looking forward to impressing my new neighbors! 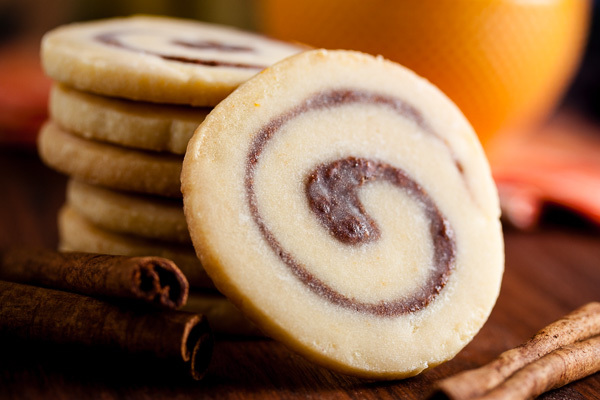 Can I roll those cookies in turbinado sugar or is granulated best? I’ve only ever used granulated on this recipe, but I think turbinado would be delicious with dark chocolate and gingerbread. They just wouldn’t have the same look (the fine sugary sparkle). Why don’t you try one of each and see which you prefer? Smart lady–I will do just that because I like the crunch of that larger crystal sugar though you are right that it won’t be as pretty. I made the dough last night (so easy, smelled great and rolled beautifully). I will sugar them up before baking tomorrow afternoon. THANKS! Wow looks amazing! Just wondered do you know how long they’ll keep before the cookie get’s too soft? Like most cookies, these should be fine for about a week if kept well-covered. And as other people have mentioned, they should also freeze well too – just be sure to wrap them tightly in plastic wrap first, AND put them in a freezer bag to avoid freezer burn. You could also make the dough in advance and freeze it, and then bake them just before you’d like to serve them! Hi, I love this cute idea. But I’m wondering if the cookie dough could be pressed around the underside of a mini muffin pan.? Just something to ponder. I know the shape may not be as desirable but…idk. just a thought. 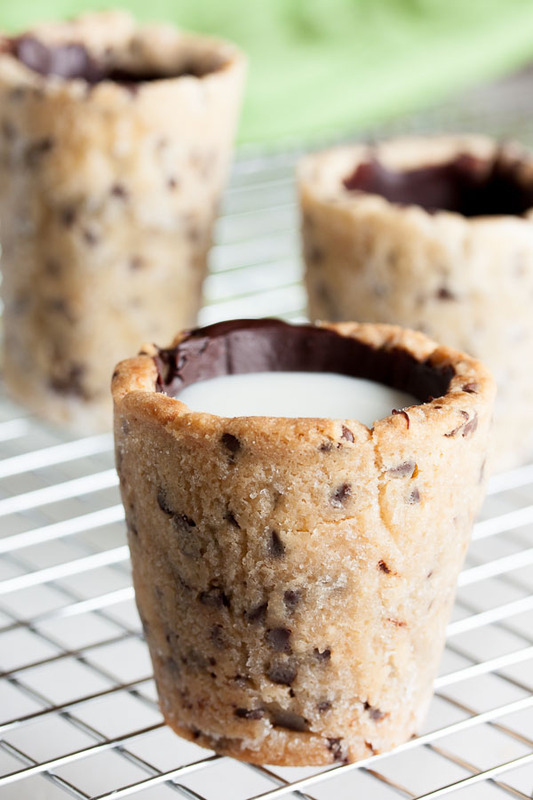 As soon as I saw this recipe, I googled, cookie shot glass mold and immediately found a Wilton product. Wilton actually makes a 8 cavity silicone shot mold and they specifically indicate one of the uses as choc chip cookie shot glasses. It can go in oven and freezer and dishwasher. Hi do you know how many these will make I shot glass form? Looks so cool thanks! hi! what’s the difference between shortening and butter? is it okay if i use shortening instead of butter?? The biggest difference between shortening and butter is the fat content. Butter is usually 80-85% fat, while shortening is 100% fat. Using shortening instead of butter will result in a softer cookie – which may not be good for something like this where you want it to hold its shape. It also won’t have the same buttery flavour, obviously. I can’t say for sure whether it would work out or not, but you can always try? okay, thanks for that! I think i’ll be using butter instead of shortening . How about the chocolate for coating the inner part of the cookie, is it okay if any kind of melted chocolate? ’cause i’m not sure if it can possibly hold the milk.. and for the texture of the cookie dough, is it okay if it is crumbly i’m confused..
okay, thanks for that! I think i’ll be using butter instead of shortening . How about the chocolate for coating the inner part of the cookie, is it okay if any kind of melted chocolate? ’cause i’m not sure if it can possibly hold the milk.. and for the texture of the cookie dough, is it okay if it is crumbly ? i’m confused..
Haha! It’s ok. Did you make the dough and it came out crumbly? It shouldn’t really be crumbly. If it is, you can let it rest for awhile – that will help the dough hydrate properly before you roll it out. As for the chocolate, you can just use melted chocolate chips if you like. For the mold, what do you think of using a few tomatoe paste cans? I was curious as to how far in advance I can make these ? Thank you! Hi Corisa! These are basically just cookies, so they should be absolutely fine for at least a week. If you want to make them further in advance, you should be able to freeze them fine. You could even do all the prep work in advance, put the dough in the moulds, and then freeze them before they’re baked. Then you can just pop them in the oven closer to the time you’d like to serve them and have fresh cookies. Good luck!